MagicKitchen.com's healthy, chef-prepared meals are prepared using top-quality fresh produce and ingredients to ensure you receive delicious, nutritious meals that are quick to prepare. The meals arrive on your doorstep frozen. All you have to do is defrost, heat and serve! Plus Magic Kitchen delivers across the entire US. 58coupons helps you save on your Magic Kitchen food with the best promotions, coupons and discounts. 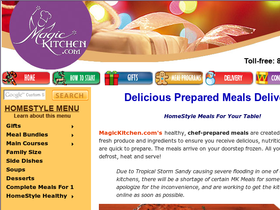 Act now and save $10 on orders from Magic Kitchen with this promo code. Enter this code for free delivery on all orders over $50 from MagicKitchen.com. Click link to get started. Save 10% on all order from MagicKitchen.com when you use this code at checkout. Click link to order today. Use this code at checkout and you'll save 5% on all orders from Magic Kitchen. Follow this link to begin.